You only see the ugly up close. Or do you? Makeup. It hides a lot. It makes things look prettier than they are. it hides flaws. The too-large pores or the blackheads, pooled areas of trapped dirt in the skin. The zits, sometimes white on top and sometimes so pink and red it’s painful to just look at them. Makeup hides the truth while creating this image of perfection. You might have a crush on someone at work. You fantasize about what your life might be like with them. And in your daydreams, they never disappoint. Of course not. Because it’s all in your mind. It’s a world you create to get yourself away from this world you now find yourself in. If you started dating them in real life, you might see that they have flaws just like yourself. Maybe they forget to shower some days or leave the toilet seat up, or leave too many dirty dishes in the sink. Maybe they take too long in the bathroom every morning, leaving you with cold, or, at best, lukewarm water when it comes time for you to take a shower. A novel that you just can’t put down. Every line, every word, seems so perfectly chosen. You wonder how these words could have come out of the author’s mind. Is he or she a genius, that much better and smarter than you, who could never come up with something so clever? It looks so “perfect.” Of course it does. It’s been edited over and over, possibly over the course of several months or even years. What you don’t see is the ugly behind it. The hours of frustration the author spent staring at a blank computer screen, the blinking cursor taunting them over and over with every second that ticked by and the page not coming any closer to being filled up. And before the advent of computers (shock, gasp! was there such a time?) the mounds of rolled up paper thrown into or around a wastebasket, thrown in a moment of sheer dramatic agony of the author, convinced that they couldn’t form a single thought in a coherent manner. Ever read through a company’s annual report or documents sent to their shareholders about how the company is doing? Be honest. From beginning to end? Of course not. If you’re not one of the document’s drafters or one of the company’s lawyers, or a student reading through it for a class assignment (yep, that was me), then you would likely fall asleep by page 3. The document looks nice and pretty from afar. Perfectly formatted paragraphs and logos and strategically placed phrases in italics, or perhaps other various uses of formatting techniques such as bold and larger fonts, hiding the ugly truth that a company is going down the tubes. But what if you only wanted to see the beauty up close? Is that possible? On a run, you see wild sunflowers up ahead. From far away, they’re like a sea of yellow and black swaying gracefully in the breeze. As you get closer, their individual shapes begin to emerge, and some beckon to you as would a grandmother to a child. You raise your hand out to give them a very slight touch with your fingertips. They look as if they are smiling in return. You whisper “thank you” to them as you run by and can’t help having a smile crawl over your face as a result. A runner then passes you in the other direction, and the smile is contagious. The feel of a lover’s kiss for the first time after a long period of separation and anticipation. The feel of a cat’s paw on your face, urging you to wake up in the morning. The first sip of a hot cup of coffee on a brisk morning, sitting outside your tent, gazing at the mountains in the distance. The tentative steps forward of an animal that was formerly abused, now daring to feel a human touch that doesn’t cause pain. Your falling asleep while sitting near them, in companionship, waking up to see them next to you, looking at you with what appears to be hope in their eyes. Hope that you will now become their family, their protector. Their love. Their life. And they will become yours. Seeing the ugly or the beauty up close is a choice. A choice only you can make. I choose beauty. To choose otherwise just isn’t possible. For me. As always, thank you for reading, and I hope you enjoy these photos, shot at Elk Island National Park, just north of Edmonton, Alberta, Canada. If you have liked this post and would like to read more like it, please hit the like button below or drop me a line, or even just share it with someone who you feel would also enjoy it. I’ve been starting to write more and I’m definitely feeling the creativity expand within me. My Environmental Ethics requires us to go on four field trips in our neck of the woods. The goal is to remain in the present for at least 30 minutes. No cell phones. No thoughts of what happened earlier today or what can happen tonight. When you find your thoughts drifting away from the present, you do your best to bring them back to the here and now. Try and use all of your senses: sight, smell, touch, hear, etc. Our assignment limits us to the number of words, and I’m finding I’m embracing those limits rather than fighting them. One of my fellow students said I should publish them somehow and he would want to read one of them every day to reconnect himself to nature. So, I thought I would do so here, in the hope that it can have some beneficial effect to those of you reading it. Our assignment limits us to the number of words, and I’m finding I’m embracing those limits rather than fighting them. So without further adieu, here goes nothing, er, my first field trip. Yesterday, I took a field trip to the section of the Bosque knowns as Tingley Beach. The Bosque is a wooded area located along the banks of the Rio Grande in Albuquerque, New Mexico. It stretches for miles with lots of dirt paths for walkers, runners, bikers, and nature enthusiasts. Usually, I run there. But yesterday, I decided I would just sit and observe. I wonder – what made me choose this spot? Because it’s familiar? But, I’ve never sat here on a log and just looked and listened while not moving. There are so many wild sunflowers growing here, some out of what appears to be dead, inhospitable wood accumulated on the ground. How did all these dead tree branches come to be here on the ground? Were they cut down? No, they’re too randomly placed. Did they break off in the wind? That seems more likely, given the winds we have here in Albuquerque, a high desert city. The breeze blows through the green leaves of the tall cottonwoods above me. I’m comforted by it, even though I can tell by its ferocity that a rainstorm might be coming. I welcome that. To the south are dark clouds. To the north are white puffy clouds that seem to be speeding effortlessly through the sky because of that strong wind. The sun keeps peeking in and out from among the dark clouds, alternately warming and cooling my body. Sitting quietly, I start to hear the sounds of birds chirping. I hear one chirp, then another, and then a third, all from different locations. They are of different types; each chirp is unique. And are those crickets or cicadas I hear? I love the sound of them, but seeing them in person freaks me out. I’m not a fan of big bugs. I hear the sounds of civilization off in the distance: traffic noise, a plane flying overhead, the sounds of humans along the dirt path. The humans are close enough that we could both see each other, but they’re too engrossed in their conversations or own thoughts to notice me sitting amongst the cottonwoods. And I am grateful because I want to be left alone to observe, to feel, to hear, to smell. I’m irritated by the intrusion. I realize I haven’t seen a single bug crawling along the log on which I sit. Surprising, because I usually see them everywhere on the path when I run. And this is the woods! As if I willed it into existence, one appears, and it’s time for me to shift positions. I take a seat on the ground near the sunflowers. I can see the honeybees darting from one flower to the next. But I don’t hear them making a sound. Funny, I thought this was grass, but it feels more like straw. Looking closer, I notice it covers the dead branches and twigs found below it. It’s uncomfortable, and it’s time for me to go, so I walk toward the river. If this post touches you somehow, please share it. And thank you for reading. 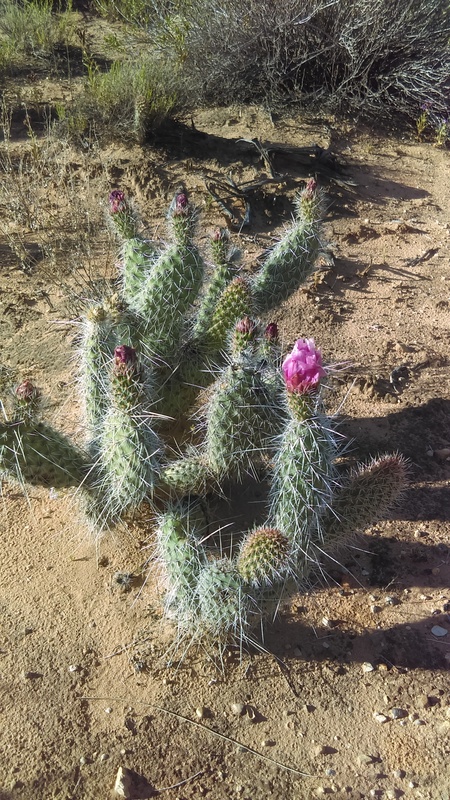 Cactuses are starting to bloom near where I live. After visiting the botanical garden, I’m more aware of them and the desert’s beauty. Amazing that something can live and thrive with so little water. When it landed on me, it really tickled! Both places reinvigorated me to remember things that really make me happy and I decided to take the plunge and go ahead and buy the Tower Garden for my apartment after all. (It’s something I have mulled over off and on for the past year or so, but when I was in the RV, I just didn’t have the available space.) I have a friend back home in Boston who has one, so I know the claims that they make of producing so much produce in such a short time are legitimate. I’ve seen it with my own eyes and tasted the produce her garden made! I know it is a bit expensive to start off with, but my goal is to eat primarily what I grow myself. I feel much better when I am eating a lot of greens and fruits, and the tower garden will even allow me to grow strawberries! Yay, I can’t wait! And just knowing it is coming, I have not had the inclination to eat a lot of sweets and junk this week. In fact, it’s just the opposite. I feel like I want to detox, detox, detox!! Get all the crap out of me and out of my apartment! 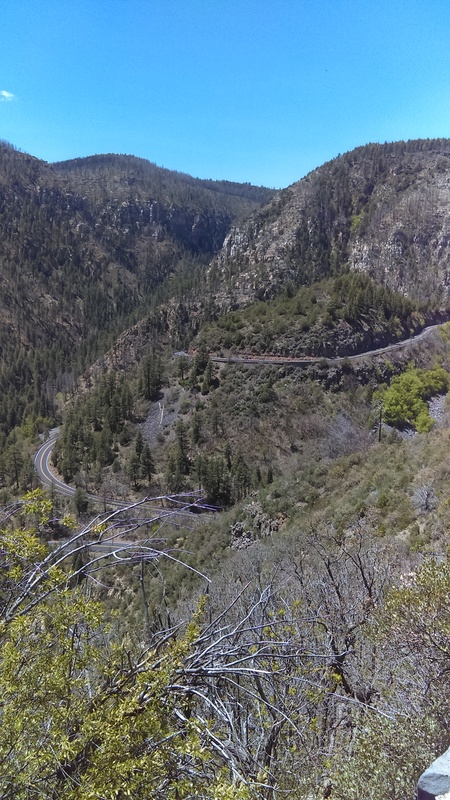 When I spent that hour along Oak Creek Drive just north of Sedona, I think it transformed me. I can’t put it completely into words but it seemed to have a profound effect on me. Since then, I just feel, well, different. It made me want to slow down and listen to the birds more and figure out why that is. Why I feel so drawn to now learning about nature and holistic health and detoxing my body, and my life, etc. View from the scenic view pullout at the top of the Oak Creek drive. This photo only shows two of the many switchbacks you have to navigate to get there. On Monday, I just had this major urge to clean out stuff in my closet, so I took about 5 bags of stuff to the local animal shelter for the animals there to use. My pets don’t need all the extra blankets I had in my closet, and they don’t need all the extra rugs and pet beds. However, the animals there do. Not all of them have a soft surface to sit on – mine do. It felt AWESOME to take all that stuff in, because I knew I didn’t need it, they did. I also realized, when I tend to hang on to more stuff, it’s coming from a place of insecurity inside myself. Like when I first moved out of my marriage, I took all these extra things like towels, and blankets, etc. I was scared at the time that I wouldn’t be able to afford even the basics so I took everything that I could that he didn’t want. I felt like more stuff equaled more security. I know now that it’s just the opposite. When I have less stuff, I feel happier and more secure because the stuff I do have is the stuff I want and love. And it’s all that I need, no more. 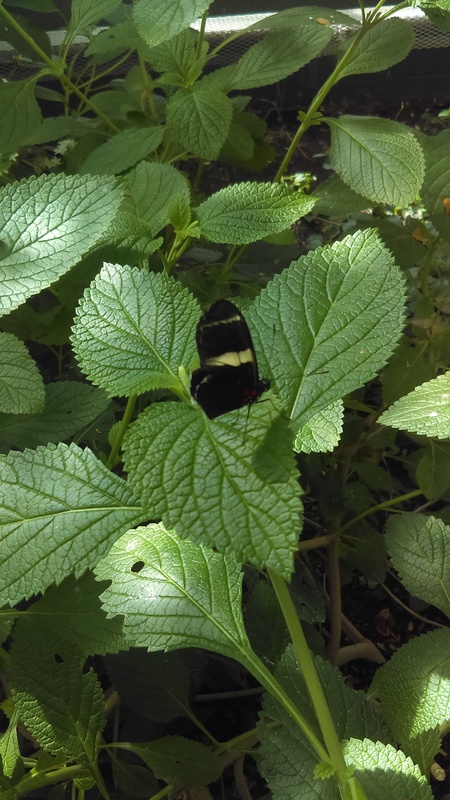 Look close – do you see the butterfly hiding among the leaves? I know Sedona is one of those new-agey kind of places, where people believe in vortexes and crystals and what a lot of people might think is a bunch of junk. But I want to open my eyes to some of it – I got a few books out from the library about crystals and their healing powers and am going to educate myself about them. Maybe there is nothing to any of it, and maybe it really is a bunch of “hooey,” but maybe I will find them helpful, and in this life, I think we need to each find our own way. If there is anything I have learned these past few years, it’s that there is no one RIGHT choice of life for any of us. Trying to pigeon-hole myself into the box or boxes that I thought were right for me only ended up hurting myself in the long run. Or, maybe, they didn’t. Maybe they were all leading me to where I am meant to be, and what I am meant to be. After all, I wouldn’t be who I am today without those experiences. I wouldn’t know how strong I can be alone if I hadn’t gone through the pain of a divorce. I wouldn’t know how empowering it feels to be true to yourself if I hadn’t not been true to myself at one point in my life. Does that make any sense? I hope so. 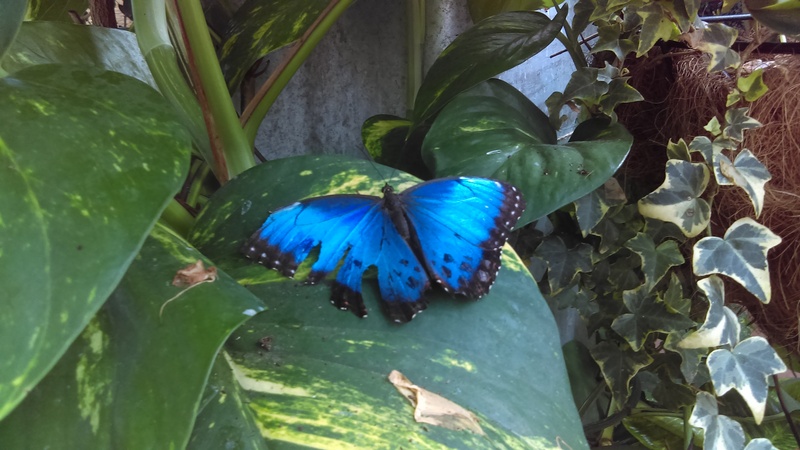 Blue butterflies always catch my attention. How can I get from here to where I want to be? I will let you know what I think of the Living Forward book when I finish it. It’s also available through Audible.com. I’ve started formulating my answer to question number 1, though, and here is what I have so far. I want to be remembered as someone who was good to animals and to others, as someone who was positive and who made a good contribution to this world. I want to have been a happy person, someone who was in touch with herself. Someone who always liked learning. Someone who wasn’t wasteful. Someone who had a good handle on her financial situation and wasn’t a mess when it came to saving money or having debt. Someone who didn’t have a bunch of extra crap in their life! I went for my first run in several weeks yesterday. A “run” might be a bit of an exaggeration. It was more like a slow jog. But it got my heart rate going, and I even broke a sweat, and I reminded myself of why I liked to exercise before. I told myself it would only be two loops around the neighborhood and that’s all I did. I also told myself that it was ok to walk, and I did. I don’t know why I just stopped several weeks ago, I just did. I was finding it hard to get out of bed in the morning and the idea of getting up even earlier. I just couldn’t stomach the idea of getting up early to exercise, even though that had been a mainstay of my life for many years now. It’s only been the last few days where I have even woken up BEFORE my alarm, and felt excited enough to get out of bed. I’m not sure what’s going on, with these changes, but I will let you know when I figure it out, if I do. 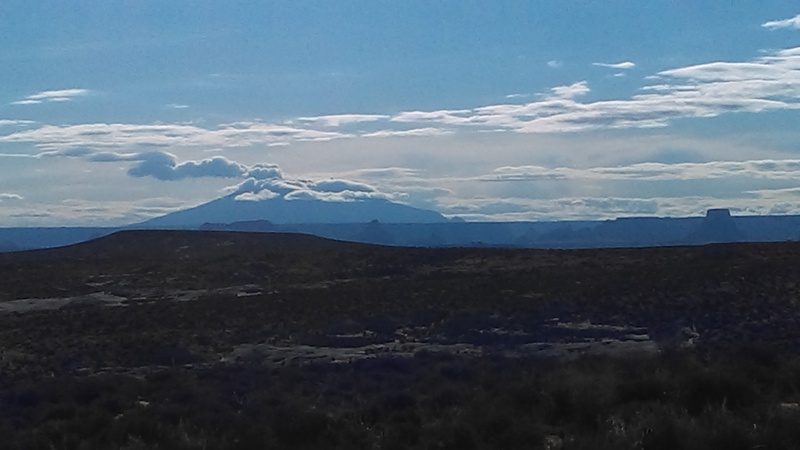 Navajo Mountain off in the distance. I see this every day from my neighborhood and on my way to work. A very sacred place for the Navajo Nation. A friend of mine from back east left a great comment on my blog last week and has inspired me very much with many of her thoughts she has shared with me. She reminded me that it’s ok to not be the person you once were. It’s ok to change. It’s ok to not feel comfortable when you are somewhere new, and that you can invent or create who you are, NOW. Who you are now can be different from who you once were. Ok, that’s enough of my musings and babblings for now – I’m going to get out there and go for my run, ahem, slow jog, and sweat out some more toxins. Until next time… thanks, as always, for reading! 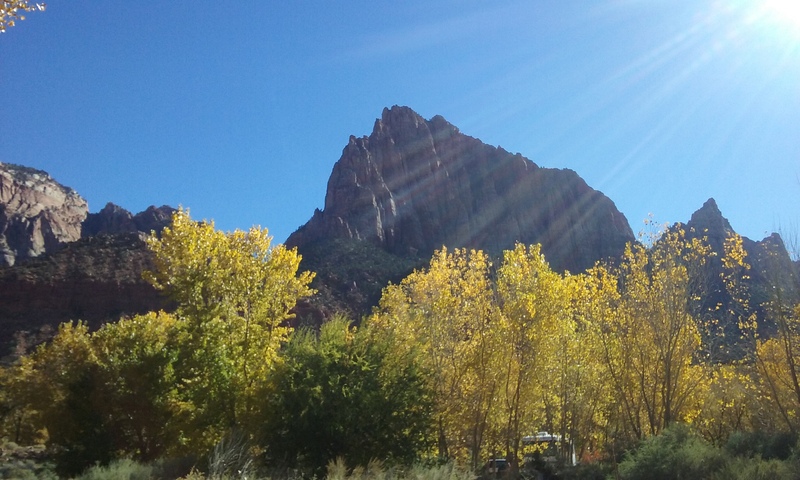 My lunchtime view – close to the Visitor Center at Zion. I *think* that rock formation is called The Watchman because it overlooks the Watchman Campground.